Much has been written about British teacher David Charlesworth's 'ruler trick': the use of a tiny back bevel - of two-thirds of a degree or so - in the plane iron sharpening process. I have found, on the contrary, much less coverage on another important type of back bevel: a back bevel - of 5-20° - used as a means of raising the effective cutting angle in a bevel-down bench plane. The relative lack of coverage, especially on how to correctly hone a back bevel, could be partly why back bevels are not as commonly used as they should be. I have a dedicated blade with a back bevel for my No.4 smoother and let me show you how easily you can put a back bevel on a blade. I will also cover the holding methods that apply if you are sharpening your blades freehand, as well as a trick for setting the cap iron on a back-bevel blade perfectly. The effective cutting angle of a bevel-down bench plane is the same as the bed angle of the plane. 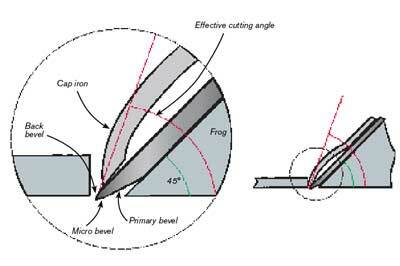 You can increase the cutting angle with a higher frog - for example, a 50° or 55° frog - but such an option is not available on most bench planes. Or, you can get a steeper cutting angle by honing a bevel to the back of the blade. For example, if you honed a 5° back bevel on a blade, the new cutting angle of your bench plane would become a York pitch at 50°. If yours is a low-angle/bevel-up plane, you may also put a small back bevel on the blade to raise the included bevel angle, thus increasing the durability of the edge for working end grain. 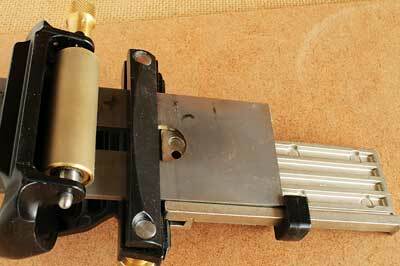 A higher cutting angle means extra effort to push or pull the plane as well as increased chances of chatter. 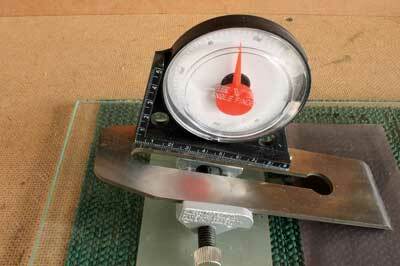 Keeping your edge sharp with frequent honing is, therefore, important. If you want to restore the blade to a lower angle of attack, you need to flatten the whole back down to the cutting edge or grind a new bevel edge beyond the back bevel. Your back bevel should be small and need not be larger than the thickness of the shaving you want to produce, say between 0.4mm and 0.8mm. 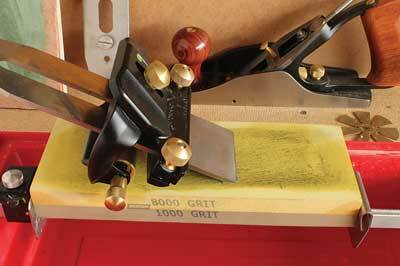 If you frequently work with difficult grain in hardwoods, why not put aside one blade dedicated for back-bevel uses. I first start with honing the primary/secondary bevel edge sharp, then I mount the blade in a honing jig with the bevel face up because we are going to hone a bevel on the back side. If you use a vice-type honing jig, you can easily set the sharpening angle with the help of an angle gauge, a protractor or an inclinometer. 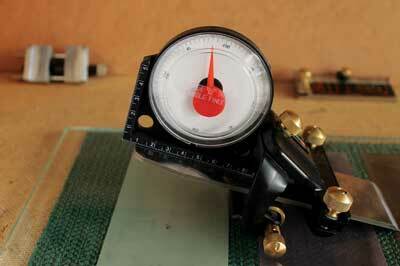 My jig has preset configurations for honing back bevels at the desired angles without the need for any angle gauge. 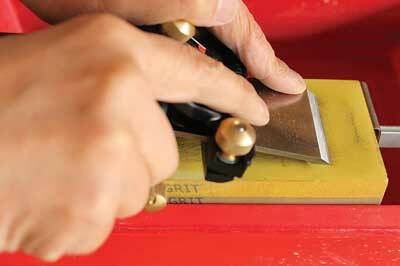 If you sharpen your blades freehand, you can still create an accurate back bevel on your blade with a shop-made guide, which is simply an angled block at the desired back-bevel angle. Attach the block to the underside of the blade with double-sided tape or with a complementary block on top and use an angle gauge or the like to verify the honing setting. 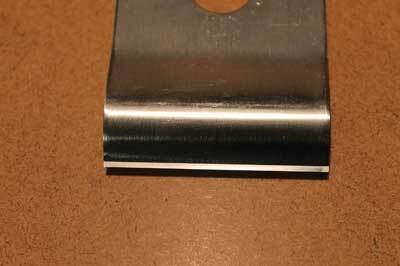 Once the blade is properly mounted, set the jig on an 8,000 grit waterstone. I used to pull the jig to hone the back bevel out of concerns about the sharp edge digging into the stone. 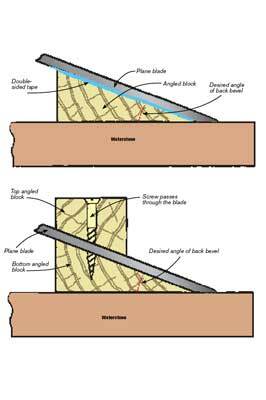 However, I found that pulling could cause a wire edge on the primary bevel and 10° or 15° is not an acute angle for the waterstone. I now use push strokes with light pressure: two passes with finger pressure on one corner, then two similar passes on the other corner and one or two final passes with pressure on the middle of the blade. As noted, we only need a small back bevel. So, check your progress before making another round of passes. When working with hardwoods, the distance from the front edge of the cap iron to the cutting edge of the blade is normally set to be 0.4mm or so. However, depending on the size of the back bevel created, such setting could result in a gap between the cap iron and the blade, leading to a chip jam. The proper way to install the cap iron is to place its leading edge about 0.8mm from the cutting edge of the blade, then hold the setup against a light and adjust the distance as necessary until no light passes through the two edges. Planing against the grain but without the usual tear-out nightmare? It is possible, if you have a properly set back-bevelled plane iron!